I first got introduced to Monster Trucks when I was a kid. I saw this truck on tv that was larger than life. The original Bigfoot. It was the truck that started it all. I was amazed by the sheer size of it and how easily it could trample cars that were laid out in front of it. I instantly became a fan and wanted to see more. Back then most of the trucks all had similar body styles just different paint styles. 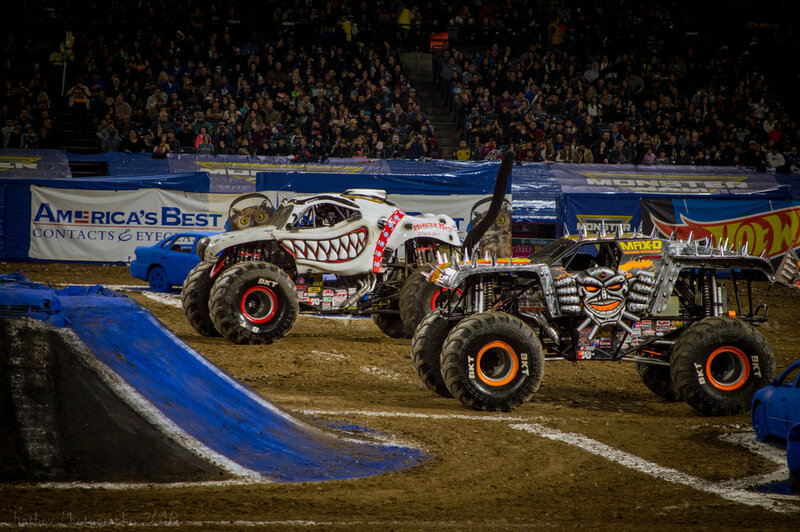 Today however, most monster trucks have unique body styles and very unique paint schemes. The events were way different back then too. There was no freestyle and there was no two wheel challenge. It basically consisted of side by side racing. I attended my first Monster Truck event at the Forum in Inglewood, CA. The trucks barely fit into the arena. The race consisted of starting at one end of the arena, waiting for the green light, then jumping over about 4 cars and the first truck to reach the other side was the winner. Races literally took about 4 seconds. The roar of the engines was so loud as they echoed throughout the stadium it made your ears ring. It was a great experience although I can't remember what else they had during that show other than the Monster trucks. Fast forward several years to a different venue, Angel Stadium in Anaheim, CA. My first year there was around 2002. Freestyle was a fairly new thing I believe. That first year we were there we sat out in the left field pavilion next to the waterfall. The seats were great because you almost felt as though you were sitting on the field. As the clock turned to 7:00pm the lights in the stadium went out and the roar of the engines could be heard outside. Shortly thereafter most of the trucks came flying into the stadium, circling the track for all to see. The top trucks would enter to their theme music one at a time. Back then, not all 16 trucks were top names. Some were local trucks that didn't have the same type of funding as say a Grave Digger, who would always make the trip to Angel Stadium. Once the trucks were introduced, qualifying would begin to see who would face who once the races actually started. The races were always exciting. 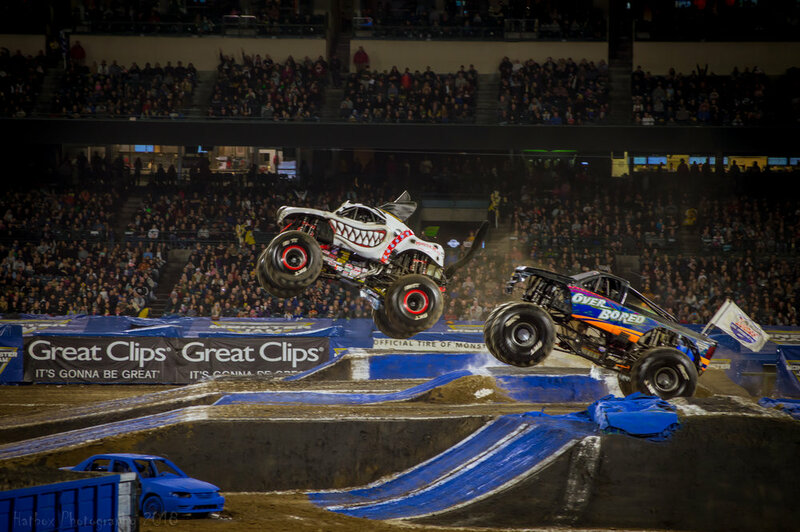 You would either get some really close races or some crazy crashes as trucks would attempt to make up some time by cutting corners only to hit a car or a dirt mound that would send the trucks into an uncontrollable spin or flip. There was rarely a dull moment. Finally after several rounds of racing a winner would be crowned and a trophy presented. During intermission, they would always have quad races or trailer races. There was always something to see at intermission. Never a dull moment. After intermission, freestyle would begin. Now when freestyle first started, it wasn't always exciting. The trucks that didn't have the funding to go out and destroy their trucks would take it very easy and wouldn't do much of anything. The better trucks and more popular trucks however would go all out and wouldn't be happy unless their truck was a twisted mess by the end. 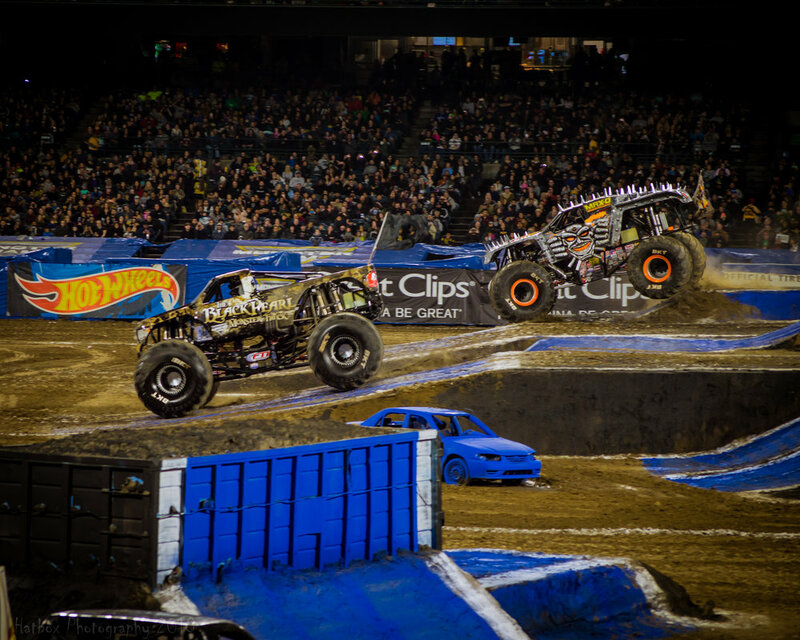 This event quickly became the fans favorite part of Monster Jam. 2018 was our 16th consecutive year coming to Angel Stadium. My wife and three close friends accompanied me to this year's event. Again we were in the left field pavilion. This is our favorite spot to sit. We've been in the seats down the third base line, we've also sat down the first base line under the overhang of the seats above us. Neither of those spots got you as close to the action as the left field pavilion does. This year several of the top trucks on the circuit made the trip to Angel Stadium which was great to see. 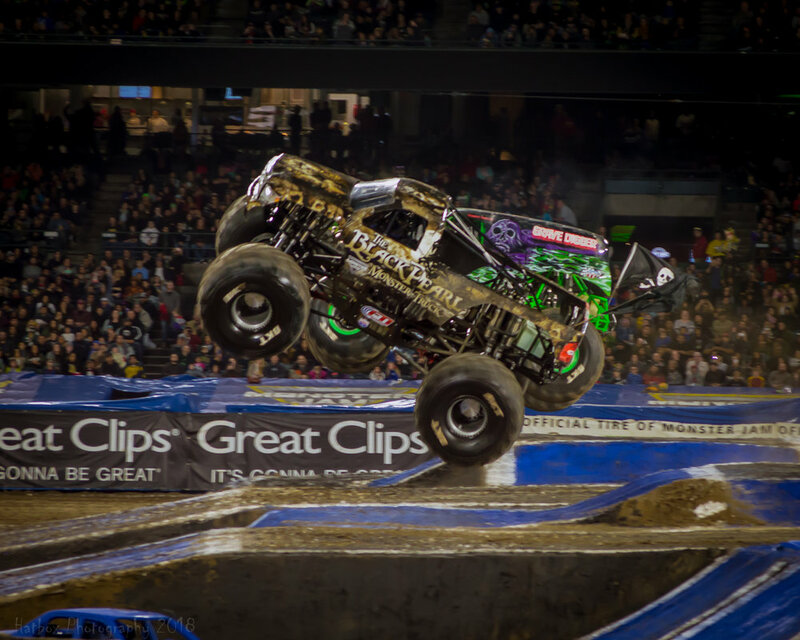 Grave Digger has always been one of my favorite trucks but over the last several years my wife and I have become huge fans of Candice Jolly, driver of Monster Mutt Dalmatian. We are both very pro women of Monster Jam. They represent the sport well and Candice is one of the best. This year was no different. She made the semi-finals and was up against Max-D driven by the one and only Tom Meents. Their race was fairly close and the quickest of the night. Max-D actually hit the wall pretty hard after he won the race. He went to the pits for some quick repairs and had he not made it out on time, Candice would have had her Dalmatian in the finals. Of course right at the last second Max-D came back onto the track for the final. Although he probably should have stayed in the pits because right after the final race started, Max-D broke and couldn't finish so the victory went to the Black Pearl driven by Cole Venard. It was a very uneventful final and we think Monster Mutt Dalmatian would have given the Black Pearl all it could handle. Congratulations to the Black Pearl though on a well deserved victory. It was a fast truck the entire night. Black Pearl flies through the air during Freestyle. He didn't win this event however he was the fastest of the night during racing and took home the victory by beating Max-D in the final. Following the races, we were treated to an exciting round of two wheel skills competition. Some of the trucks weren't up to the task but most of them put on a great show. 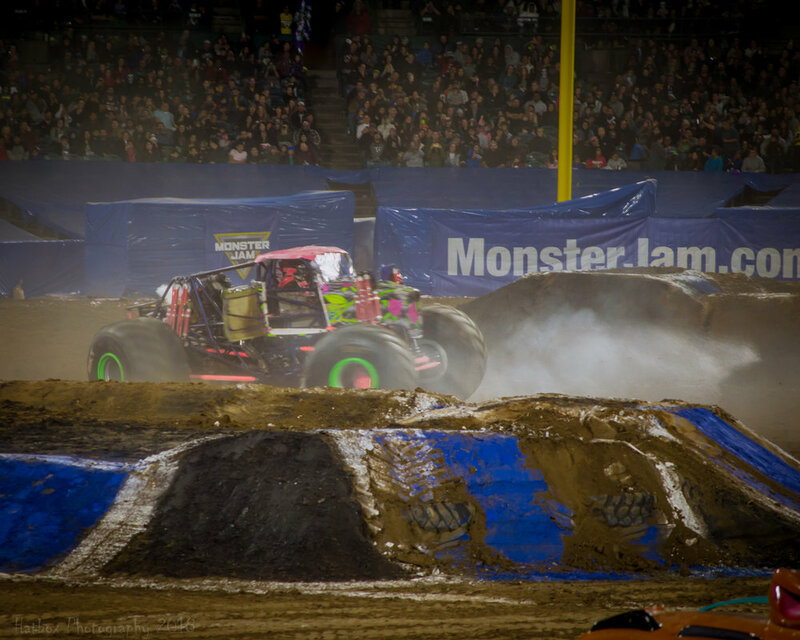 Wild Flower driven by the young and exciting Rosalee Ramer (who began her Monster truck career at just 14 years of age) did one of the greatest cyclones we have ever seen at a Monster Jam event. The crowd was going crazy when she finished. Her score of 8.879 was 2nd highest of the night. The winning score of 9.648 went to Charlie Pauken in Grave Digger. The win was well deserved as Charlie laid down two incredible tricks. Wild Flower driver Rosalee Ramer getting up on her nose during the two wheel competition. Her crazy cyclone came just after this. 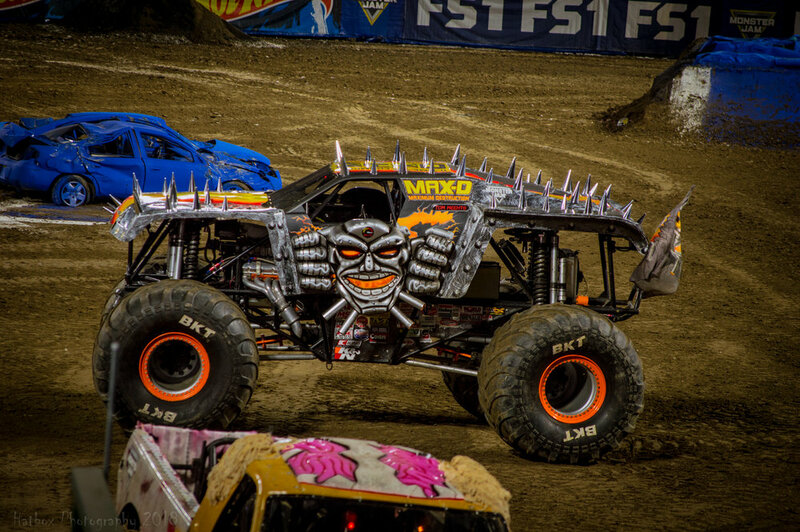 Learn more about Wild Flower at: https://www.monsterjam.com/en-US/trucks/wild-flower or give Rosalee a follow on Instagram at rosaleeramer. Over Bored driver Jamey Garner getting some big air during freestyle. Visit https://www.monsterjam.com/en-US/trucks/over-bored to learn more about Over Bored. Freestyle is a fan favorite but sometimes it doesn't live up to it's hype. For whatever reason trucks break too early or don't take enough chances. You just end up leaving the stadium a bit disappointed. Not on this night. Most of the trucks let it all go and put on one heck of a show. There were a couple of trucks that didn't really challenge themselves or the course and their scores reflected that. 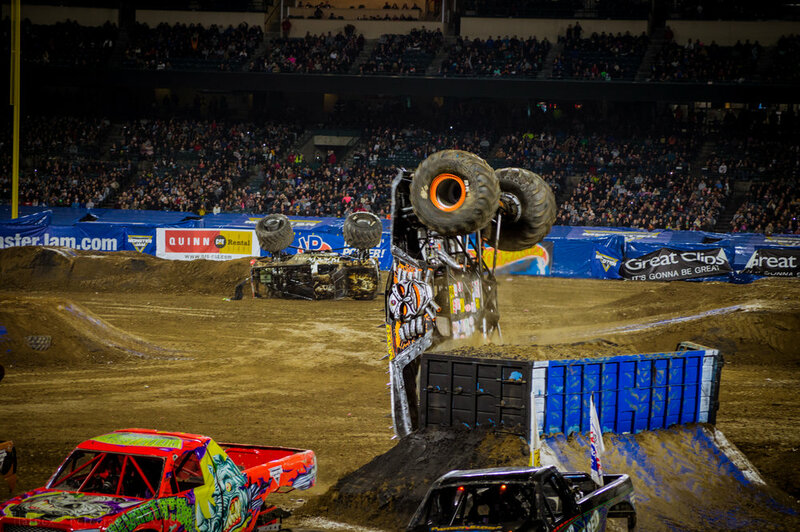 But for the most part, truck after truck put down an exciting run that had the Anaheim crowd roaring and on it's feet. We were a little sad that we didn't get to see a full run by Wild Flower. After her two wheel event something must have happened to the truck because when Rosalee came out for freestyle, she was only able to do one trick before she had to call it a night. I bet she would have put together a monster run in freestyle with a truck that was 100%. One truck that laid down a fantastic, exciting run filled with big air was El Toro Loco. This bull always brings it during freestyle. One of the craziest stunts of the night was when El Toro Loco plowed through the side of the back-flip ramp. Pictures of this can be seen below in our photo gallery. We weren't sure if other trucks that followed would still be able to utilize the ramp considering how it looked after the bull gored it as if it was a matador waving a red flag in his face. Surprisingly though, the ramp survived with a little help from the infield crew and drivers that followed were able to use the ramp and complete some sick back-flips including Grave Digger. Speaking of Grave Digger, Charlie Pauken went full throttle during his freestyle run, jumping off just about everything on the infield. In the past, we have seen Charlie go so big off the first jump that the truck breaks and we literally get 20 seconds of Grave Digger freestyle. It comes with the territory when you go all out from the start. But on this night, Charlie went big for 2 full minutes and put together a score that would be unbeatable. He landed a perfect back-flip 3/4 through his run which led to the high score of the night. The crowd was very appreciative of his efforts and let him know it. 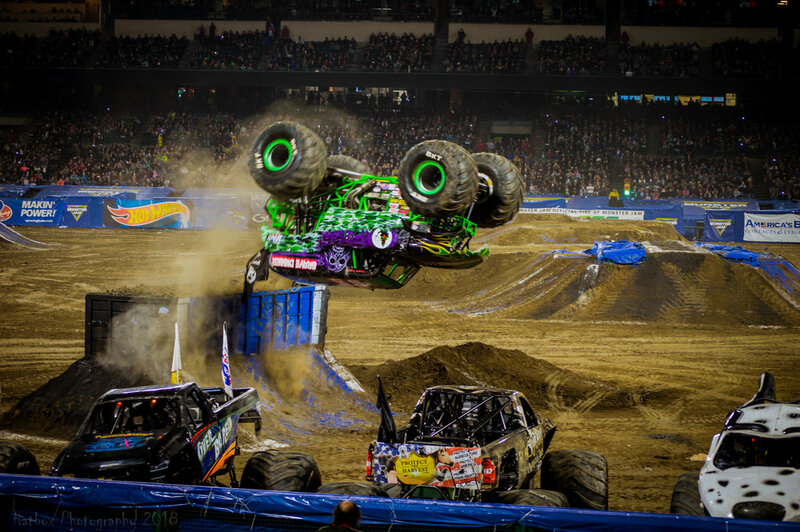 The only truck with a chance to take down Grave Digger was Maximum Destruction driven by the one and only Tom Meents. Tom brought it like always and through down everything he could, but in the end it would not be enough as Grave Digger took home the win in Freestyle making it a 2 out of 3 night. Had he been able to win the race as well, it would have been a perfect night for Charlie Pauken. 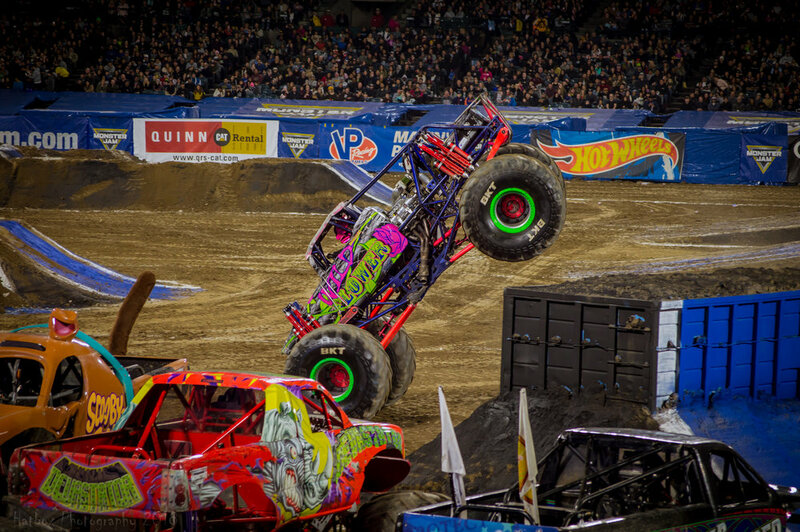 Overall this was one of the best nights of Monster Jam in quite a long time at Angel Stadium. The racing was exciting, the two wheel competition was fun and some of the driver's had an interesting way of going about their tricks, and freestyle had everything you could ask for with big air, giant tricks, broken trucks, flips, spins and Charlie Pauken digging more graves for his fellow competitors. 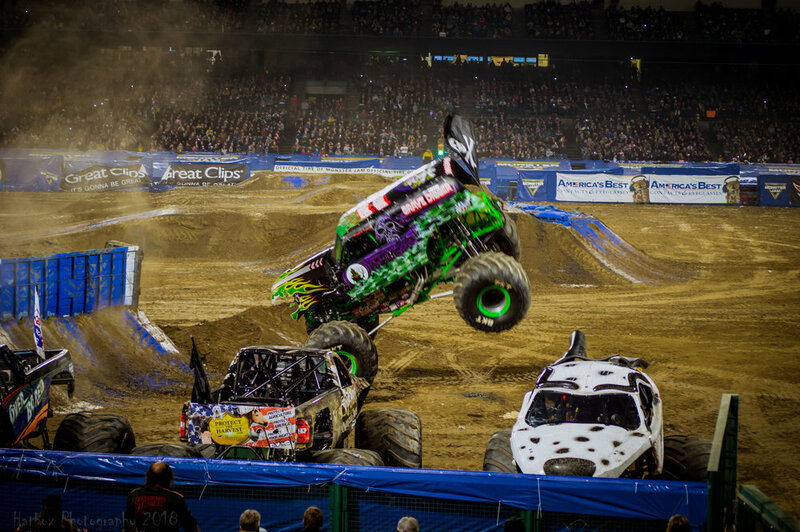 If you have never been to a Monster Jam event we highly recommend going at least once. If you have kids, take them to the pit party before the races so they can meet the drivers, get some autographs and take photos in front of the actual trucks. The only downside to an event like this is trying to leave the parking lot at the end of the night. Angel Stadium isn't too bad. It usually takes about half an hour - 45 minutes to get out. There are other parking options near by that are within walking distance that are cheaper and easier to get out of if you don't mind a little extra exercise before and after the event. Hope you enjoyed our review of Monster Jam 2018. Feel free to share the link with your friends and family so they can get a taste of what it is all about. Thank you for reading. Stay tuned for plenty more blogs and reviews. Max-D driven by Tom Meents. 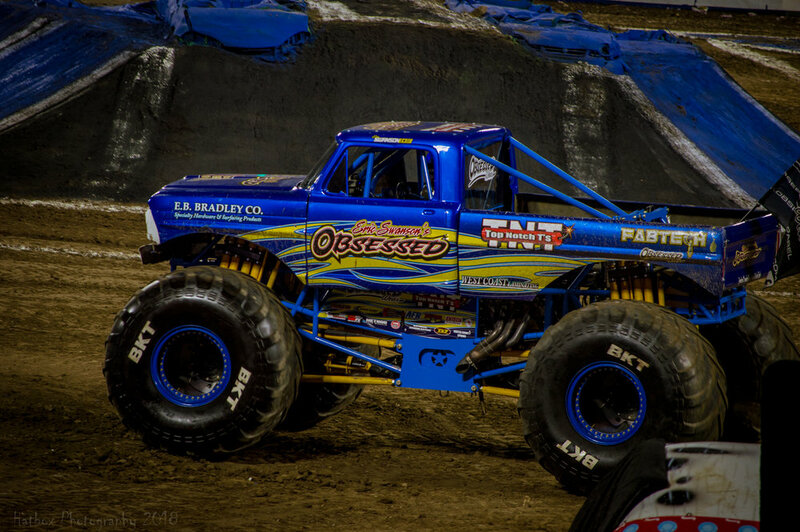 The most decorated truck on the circuit, Tom has won the racing title no less than 6 times and claimed the freestyle title 5 times at the World Finals in Vegas. Tom is the only driver to win both the racing title and freestyle title at the World Finals in the same year. 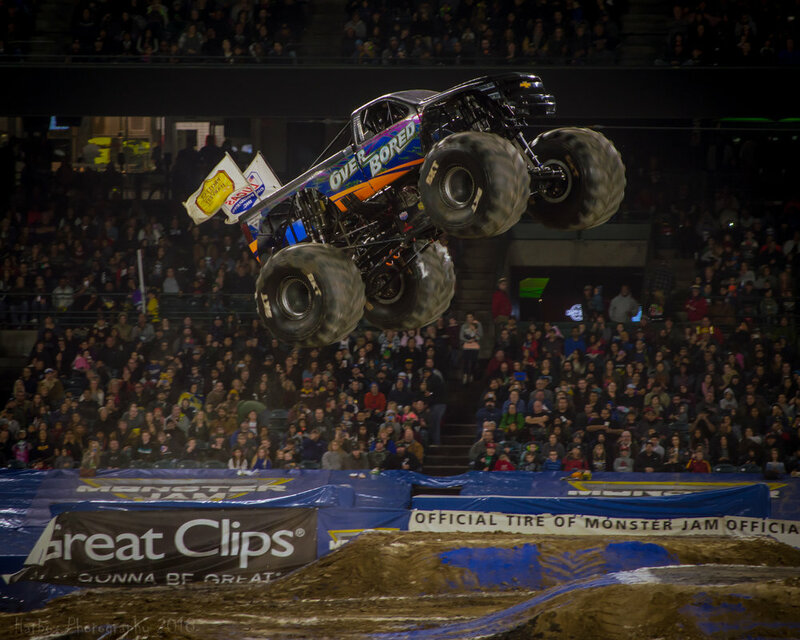 Grave Digger is an original concept from Dennis Anderson and one of if not the most popular truck on the Monster Jam circuit. Charlie Pauken usually drives Grave Digger when the truck comes to Anaheim and always puts on a great show. 2018 was no different. Monster Mutt Dalmatian is another fan favorite and for good reason. Candice Jolly who usually drives at Angel Stadium is one of the best drivers on the circuit. She is not afraid to go fast or go big during freestyle. She is also one of the kindest and fan friendliest athletes in all of sports. The Black Pearl driven by Cole Venard had a very successful night in Anaheim. As previously stated he beat Max-D in the racing portion of the event. In the two wheel event, Black Pearl scored a very respectable 6.879 and in freestyle Cole threw down a very exciting and fun run that scored 7.982 which placed him 7th overall. 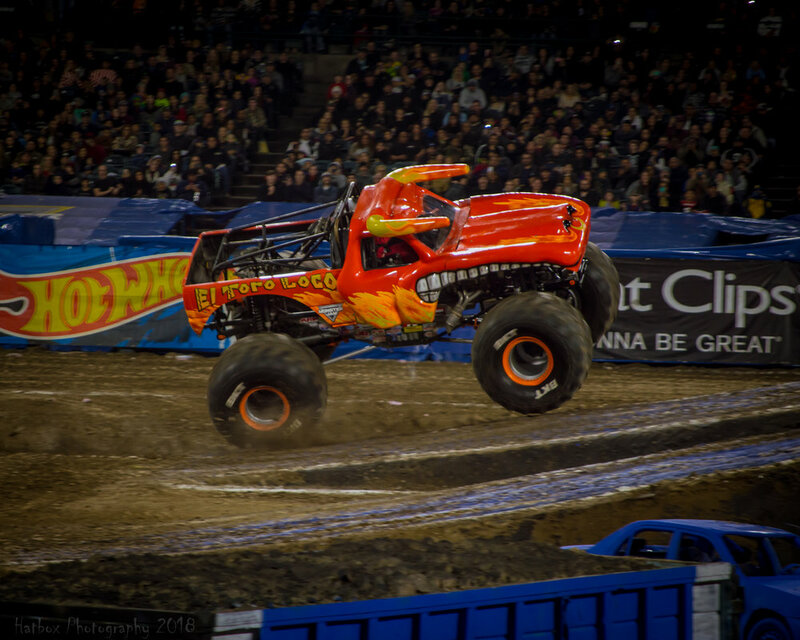 Team Hot Wheels Firestorm driven by Scott Beutow gets some of the biggest air in all of Monster Jam. His truck just seems to glide through the air like a bird in flight. He is always a threat to win freestyle no matter what arena or stadium he is in. 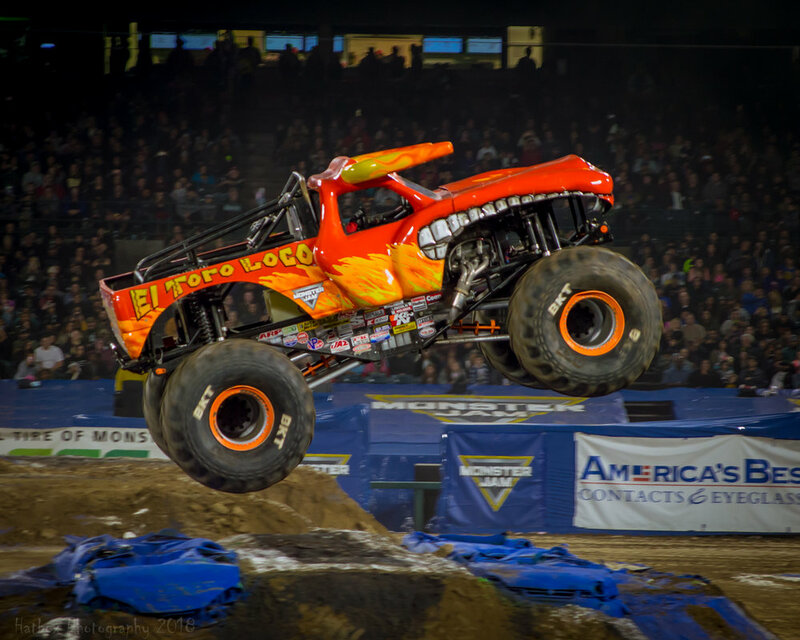 When you talk about exciting trucks to watch during a Monster Jam event, you can't forget about El Toro Loco. This bull lays down monster runs every time it is on the track. We usually see Becky McDonough who is another outstanding female driver, but this year El Toro Loco was driven by Chuck Werner and he didn't disappoint. He put together some trademark tricks of this truck while also thinking outside the box and attempting tricks that no other truck had the guts to try. Wild Flower is driven by one of the most exciting young drivers on tour. Rosalee Ramer always puts on a great show and she has a long career ahead of her. The body style of her truck matches that of her father's, Kelvin Ramer who drives Time Flys. Kelvin always goes big on his jumps so his truck his properly named. This family takes great pride in their accomplishments considering it took them 20 years and three tries to finally have a truck ready to compete on the Monster Jam circuit. Zombie debuted in 2013 after a fan voting contest so this truck is really a truck of the people. In Anaheim this year it was driven by Colt Stephens. He put up a good fight during racing and almost wrecked at the end trying to win his race. He made a good save though and survived the zombie apocalypse, at least until freestyle rolled around where he wrecked while attempting a backflip. Scooby Doo is another truck that debuted in 2013 and has been a high flying fan favorite ever since. 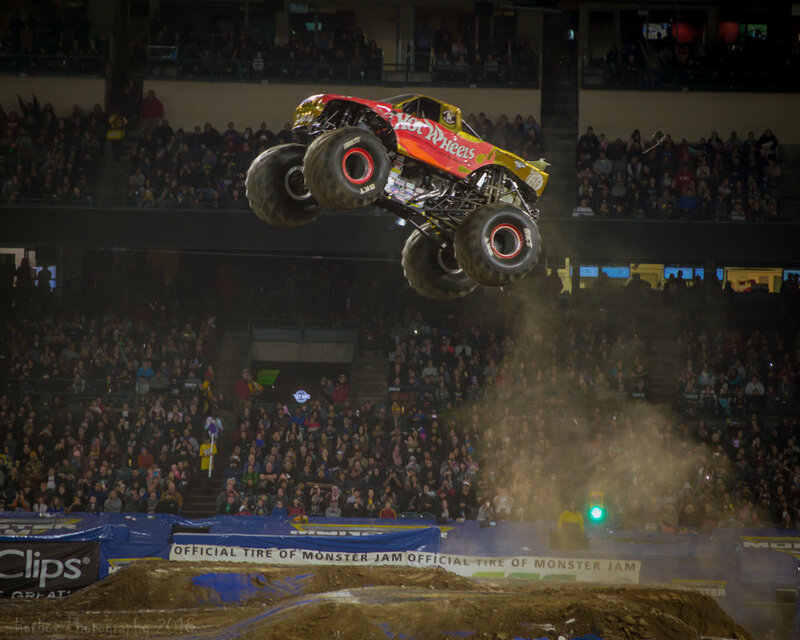 This truck gets big air on a nightly basis and makes it a goal of theirs to be top dog at every event. In Anaheim, John Gordon was given that task and in round 1 of racing faced another dog, Monster Mutt Dalmatian. 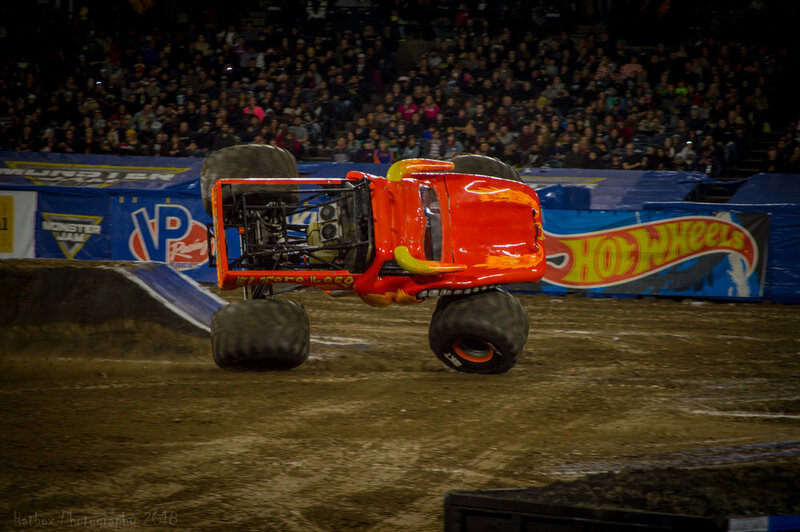 Unfortunately for Scooby Doo, the Dalmatian came out on top but during freestyle, John took his truck to new heights but only scored a 6.460 leaving him 9th of 14 trucks that night. Obsessed is driven by Eric Swanson, the son of long time Obsession driver Rick Swanson. Eric is a young gun in the sport but is capable of scoring big on any given night. In Anaheim, Eric lost in round 2 of racing to the eventual winner Black Pearl and finished middle of the pack in both the two wheel challenge and freestyle. Eric has a bright future ahead of him and continues to learn at each and every event. Watch out for this truck in the near future. Devastator driven by Aaron Basl is a truck that has been around for years and has had some success on the Monster Jam circuit. 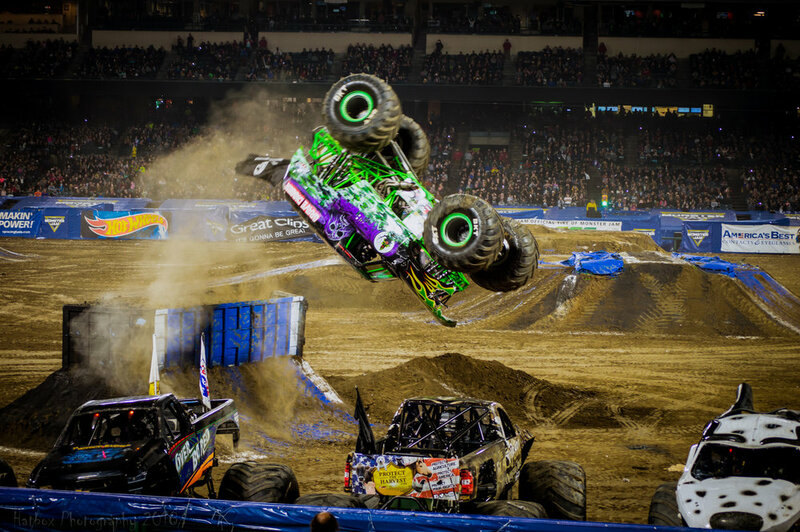 In Anaheim, Devastator lost in round 2 to Max-D during the racing portion of the event. The two wheel event and freestyle weren't very kind to Aaron either, but sometimes that's the way events go. No doubt he will bounce back and finish the season strong. Over Bored driven by Jamey Garner going head over tires during freestyle. This truck had a pretty decent night. He took down El Toro Loco in round 1 of racing then lost to Monster Mutt Dalmatian in round 2. The two wheel competition wasn't too kind to Over Bored but in freestyle after this backflip, Jamey scored a 4th highest total of 8.808. It was a very fun and exciting run for sure.